Posted on May 8, 2018 at 2:24 pm. As part of the preparation towards the opening of the Hard Rock Hotel & Casino Atlantic City on June 28, workers at the site have already mounted the eight-foot-tall Hard Rock Hotel and Casino sign in gold letters. This will be the main sign and identity of the redeveloped and rebranded former Trump Taj Mahal casino and resort. Formerly the Trump Taj Mahal casino resort, it will be operating under the new name Hard Rock gaming and entertainment complex. Carl Icahn, former owner of the resort sold it to the Hard Rock International in 2017. 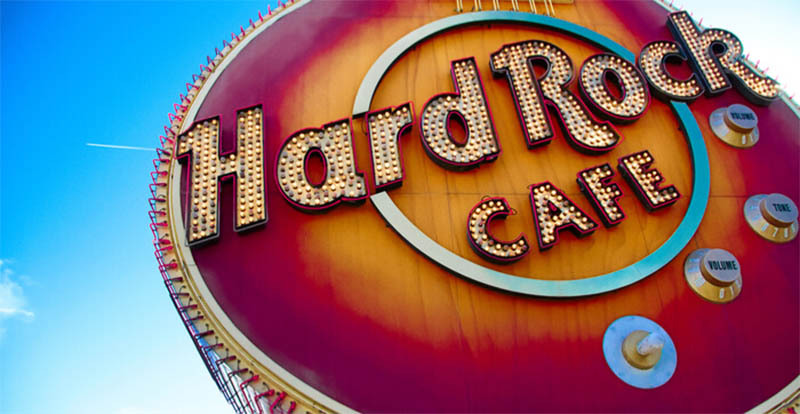 After the sale deal, Hard Rock International promised to invest more than $500 million to give the property a new look and change its theme into a rock and roll casino resort. The company’s signature guitars would also replace the Taj’s iconic minarets. Near its total completion and subsequent opening, workers on the project have installed the sign 11 stories above the ground at the exterior side overlooking Pennsylvania Avenue. Earlier last week Hard Rock Atlantic City also hired Leonard Coleman a 54-year-old craps dealer from Atlantic City as its 3,000th employee. The company is expecting to hire about 500 more workers by June. Despite the property being formerly used in casino operations, Hard Rock Atlantic City resort still have to acquire a license from the gaming regulator, Casino Control Commission. According to a local media report, the Commission has scheduled May 9 for the hearing of the casino license for Hard Rock Atlantic City. In compliance of the gambling regulations, top officials of Hard Rock International including President Matt Harkness, investors Jack Morris and Joseph Jingoli, and CEO and Chairman Jim Allen are also expected to meet the Casino Control Commission to be able to operate the new property as a gaming venue. Also expected to open this summer is the Ocean Resort Casino, formerly Revel. The main opening date is unknown but there are speculations in the local media that it is scheduled on the same date as Hard Rock’s resort.